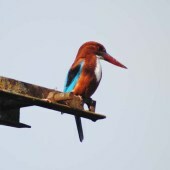 The Majuli Island sustains bio-diversity due to its geographical and physiographic conditions with climatic variations. The island is bound by the river Subarnsiri and her tributaries Ranganadi, Dikrong, Dubla, Chici and Tuni etc. on the north-west, the Kherkutia Suti (a spill channel of the river Brahmputra) in the north-east and the main Brahmputra River on the south and the south-west. 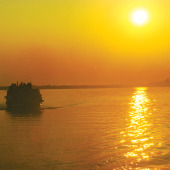 Majuli falls within the greater Brahmaputra valley of Assam and influenced by monsoon climate. Its location, presence of wetlands and high level of water table keeps environment moist throughout the year except for driest months of December and January. The mean annual rainfall over the period of 1980 to 2004 is 1704.65 mm. More than 90 per cent of annual rainfall is received in the months of April, May, June, July, August, September and October. The mean rainfall in December and January is less than 20 mm with a variation of 0.0 to 132.09. The mean temperature is 24.1°C with range of 7° to 37°C. The mean summer temperature is 26.8°C and winter temperature is 7.3°C the maximum temperature above 32°C reaches in May and experiences minimum temperature of 7°C in July and January. The relative humidity is also high amounting above 80%. 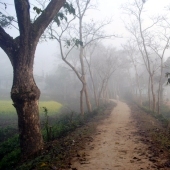 The comfortable season for Majuli consist of the months of October to February; severe dusts are common in winter season due to dry sandy top soils. The co-ordinates of Majuli Island is N 94° 10'25'' and 27° 06' 11'' E, S 94° 09' 33'' and 26° 49' 29'' E, E 94° 31' 10'' and 27° 05' 09'' E, W 93° 44' 47'' and 26° 47' 01'' E. The network of tributaries and land form of the Island such as wet land, chapories, swamps, marshes etc. plays a significant role in developing the hydrological systems of the Island. The geographical conditions and physiographic conditions cause annul flooding which brings fine silt and clayey sediments. These characteristics of the Majuli Island support the growth of diverse flora and fauna. They are among the significant components which played vital role in the process of evolution and formation of the Majuli Island as cultural landscape. High rainfall, high moisture content in the soil and flat plains favors the growth of evergreen and deciduous trees, grasses, and a wide variety of marsh vegetation, bamboos and canes. The Majuli has a wide variety of trees, shrubs, creepers, palms, bamboos, ferns, aquatic plants, grasses, cactus etc.